It was a gorgeous spring evening for the PV/opening night of Housed: [7 April 2015] with approximately 50 guests, showing the work of 12 artists in the MA Fine Art course at Chelsea College of Arts. 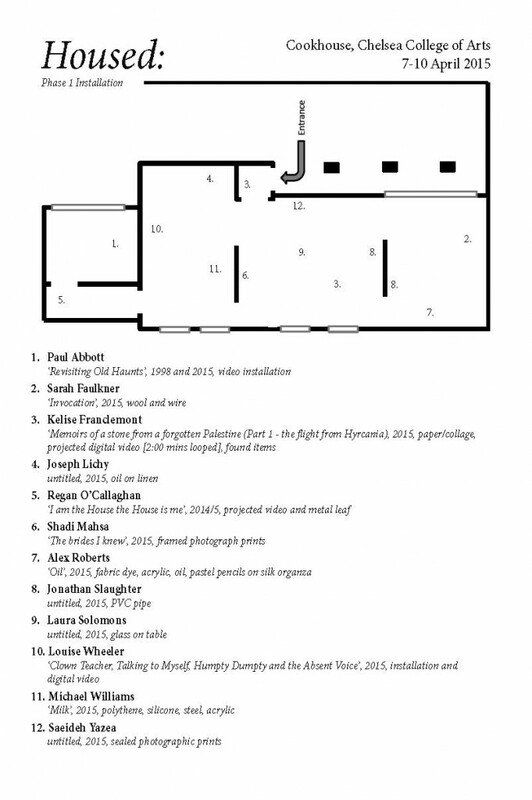 For the first half of the project/residency, the artists installed their work without curator input. In the middle of the week, the curators re-hang the show, offering a fresh perspective on the work and the exhibition as a whole. Exhibition ends 10 April 2015. Paul Abbott, ‘Revisiting old haunts’, 1998 and 2015, video installation. Opening night and private view of ‘Housed:’ at Chelsea College of Arts, London. Photo credit Thomas Butler. Sarah Faulkner, ‘Invocation’, 2015, wool and wire. Opening night and private view of ‘Housed:’ at Chelsea College of Arts, London. Photo credit Thomas Butler. Kelise Franclemont, ‘Memoirs of a stone from forgotten Palestine (part I – the flight from Hyrcania)’, 2015, drawings/college, projected digital video and found items. Opening night and private view of ‘Housed:’ at Chelsea College of Arts, London. Photo credit Thomas Butler. Joseph Lichy, untitled, 2015, oil on linen. Opening night and private view of ‘Housed:’ at Chelsea College of Arts, London. Photo credit Thomas Butler. Regan O’Callaghan, ‘I am the House, The House is me’, 2014/5, projected video and metal leaf. Opening night and private view of ‘Housed:’ at Chelsea College of Arts, London. Photo credit Thomas Butler. Shadi Mahsa, ‘The brides I knew’, 2015, performance and framed photograph prints. Opening night and private view of ‘Housed:’ at Chelsea College of Arts, London. Photo credit Thomas Butler. Alex Roberts, ‘Oil’, 2015, fabric dye, acrylic, oil, pastel pencils on silk organza. Opening night and private view of ‘Housed:’ at Chelsea College of Arts, London. Photo credit Thomas Butler. Jonathan Slaughter, untitled, 2015, PVC pipe. Opening night and private view of ‘Housed:’ at Chelsea College of Arts, London. Photo credit Thomas Butler. Laura Solomons, untitled, 2015, glass on table. Opening night and private view of ‘Housed:’ at Chelsea College of Arts, London. Photo credit Thomas Butler. Louise Wheeler, ‘Clown Teacher, Talking to myself, Humpty Dumpty and the Absent Voice’, 2015, installation and digital video. Opening night and private view of ‘Housed:’ at Chelsea College of Arts, London. Photo credit Regan O’Callaghan. Michael Williams, ‘Milk’, 2015, polythene, silicone, steel, acrylic. Opening night and private view of ‘Housed:’ at Chelsea College of Arts, London. Photo credit Thomas Butler. Saeideh Yazea, untitled, 2015, sealed photographic prints. Opening night and private view of ‘Housed:’ at Chelsea College of Arts, London. Photo credit Thomas Butler. See more photos from the PV of Housed: on Facebook.